Rest & Relish Weekly Meal Plans include six vegetarian or pescatarian dinners with simple substitutions for vegan and gluten-free diets. 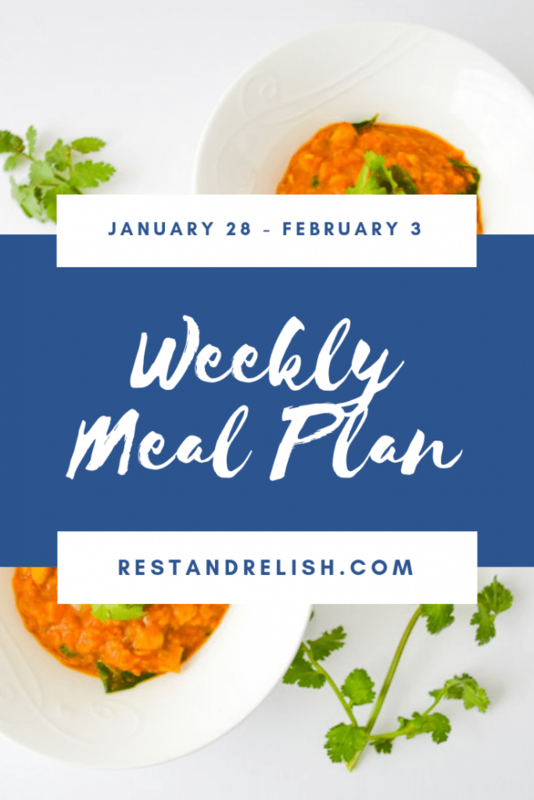 This week’s Rest & Relish Weekly Meal Plan includes three vegetarian options, a one-pot vegan meal, one pescatarian night and a Sunday Game Day menu with something for every diet! This week’s Meatless Monday is a nourishing one-pot meal. Sweet Potato Chickpea Curry is ready in under 45 minutes and includes lots of anti-inflammatory ingredients such as spinach, sweet potatoes, beans, garlic and turmeric. Simply make your own taco seasoning to season your favorite protein, add some lettuce, healthy veggies, and salsa. It’s that easy and especially fun for the kids to build their own salad! We like a combination of black beans, romaine lettuce, chopped peppers, salsa, Greek yogurt, and hot sauce. The kids also like to add chips to their bowl for a little extra crunch! Vegan Adaptation: Omit Greek yogurt. Foil packets are such an easy weeknight meal and easily customized to individual preferences. Our packets will include salmon, peppers and snow peas. Cut pieces of foil, place vegetables on foil, and add salmon on top of the vegetables. Pour your favorite marinade on top of the salmon and fold the foil into sealed packets. Place each foil packet on a large baking sheet and bake for about 20 minutes at 400°F. You can also swap the salmon for chicken, but you’ll need to crank up the oven to 425°F to cook in a similar time frame. Gluten-Free Tip: Make sure to choose gluten-free ingredients for your marinade. Use any leftover veggies like spinach and peppers to scramble in your eggs. Serve with Easy Pimento Cheese Biscuits. Gluten-Free Adaptation: Omit biscuits and serve with corn tortillas if desired. Simply boil brown rice noodles, add sauce (we like a peanut sauce), sprinkle chopped veggies and cilantro. So easy! Gluten-Free Tip: Make the peanut sauce with tamari instead of soy sauce. Leftovers or out to dinner. I’ll make my Easy Refried Black Bean Dip, wings for the meat-eaters and my veggie chili. The chili recipe will hit the blog this week, so be sure to subscribe so you don’t miss it! I hope this Rest & Relish Weekly Meal Plan is helpful to you . What looks good to you or what would you add? Please pin my meal plan to Pinterest for your reference and tag @restandrelish on Instagram and Facebook if you make any of my recipes! I would love to see your renditions and hear from you!